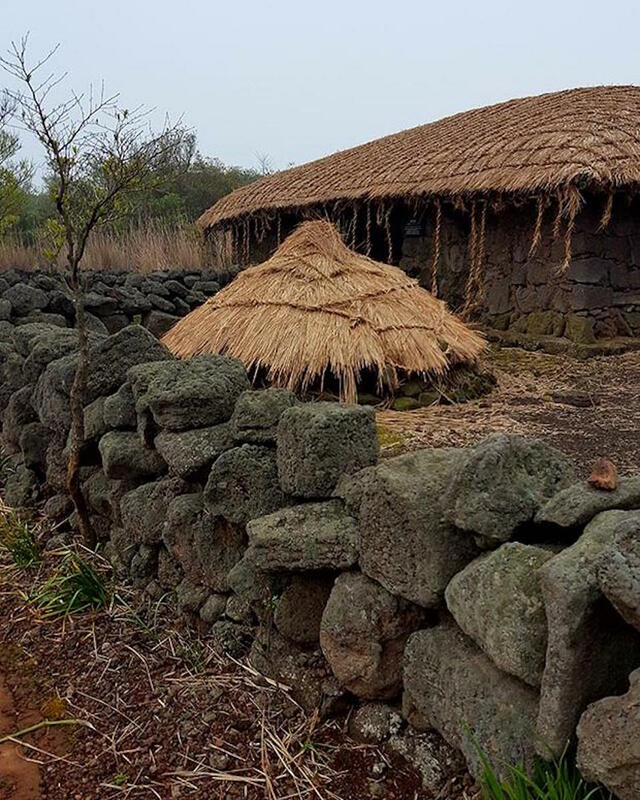 To the residents of Jeju Island, south of the Korean mainland, stones are not just objects. Stones bear silent witness to the story behind the island’s creation. Jeju Island was formed by volcanic eruptions, with the most recent eruption happening about 5000 years ago. Hallasan, a dormant volcano and the highest mountain in Korea, lies in its center. According to island mythology, a goddess named Seolmundae created the island, as well as Hallasan Mountain itself. 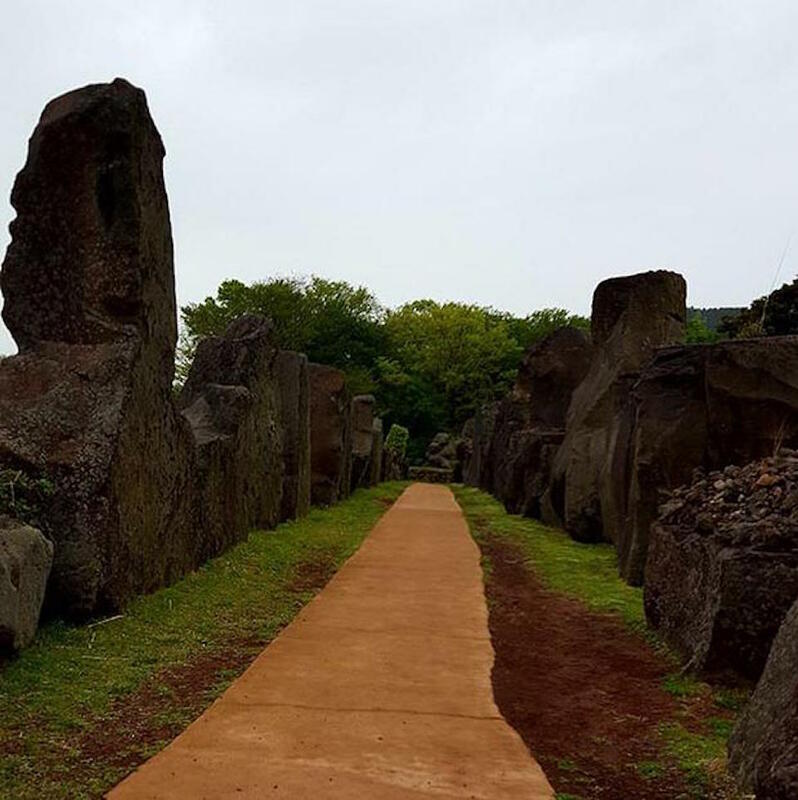 That mythology, along with the island’s natural and artificial stone works, is celebrated at Jeju Stone Park. Open since 2006, the park currently contains the Jeju Stone Museum, Jeju’s Traditional Thatched-Roof Houses, and a Stone Culture Exhibition Hall. The very layout of the park pays homage to Seolmundae, says the park’s founder and director Paek Uncheol. 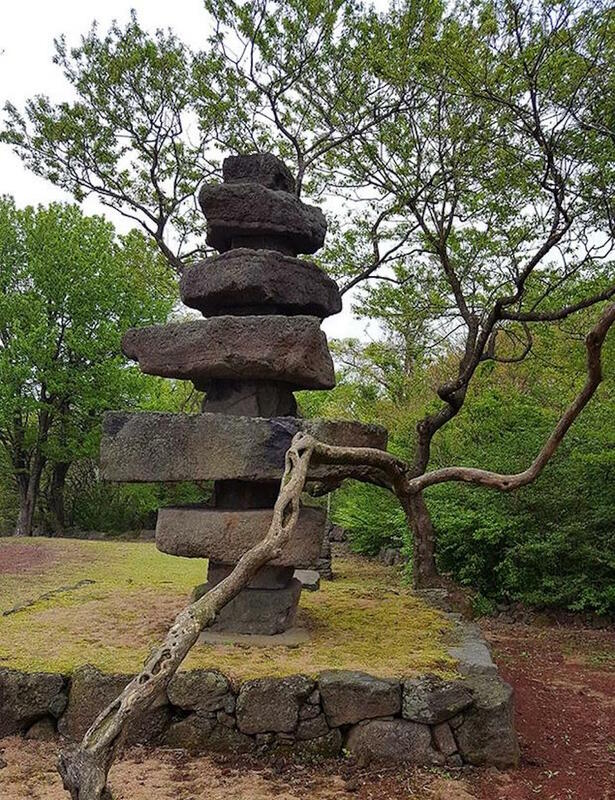 “Visiting the park is intended to be a journey through the mythology of the island, entering through the ear of Seolmundae, progressing through the body and exiting at the feet. It represents the journey of life and death,” he tells local paper Jeju Weekly. It took Baek 40 years of collecting and 20,000 stones to create a park that honors the importance of stones in Jeju’s creation myth and culture. When it came time to build a museum, the architects were careful to design a structure that fit into the landscape in a natural way. The Stone Museum was built on a former landfill and is cut into the ground so that only the roof of the building is seen from outside. To enter, you must go underground. Inside, the museum’s basalt concrete walls and volcanic ash floors emulate the natural colors and textures found on the island. Inside the museum, rows of distinctive stones stand on display in exhibits about the geology of the island. Some of the stones are worn by wind and rain, smoothed and polished into gleaming sculptures. 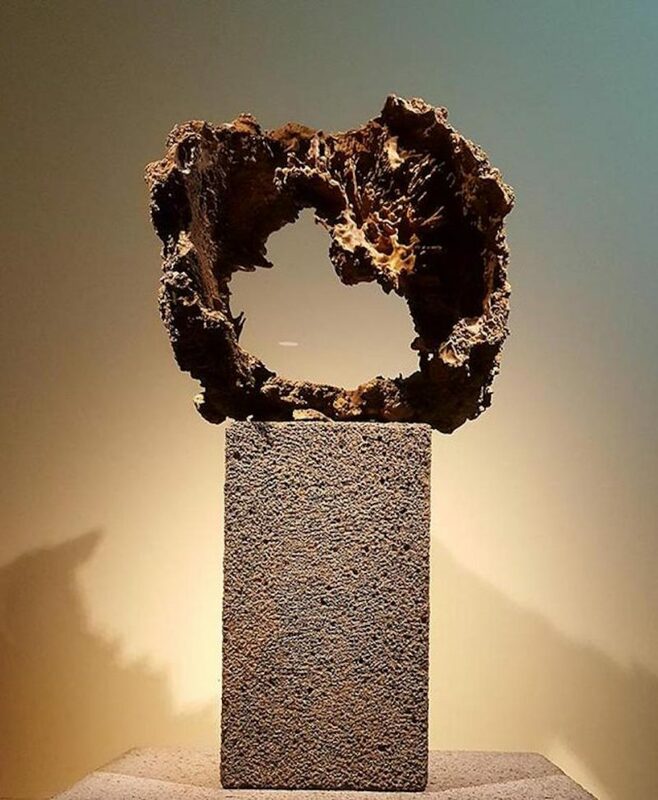 In other rooms, filigreed tree trunks and other natural objects stand transformed by volcanic eruptions that preserved—or helped create—their delicate shapes. After touring the museum, visitors can explore the park, walking down pathways bordered by giant peaked rocks. With only the sounds of wind and bird song as a distraction, it’s easy to appreciate and absorb the quiet dignity of the ancient stones. 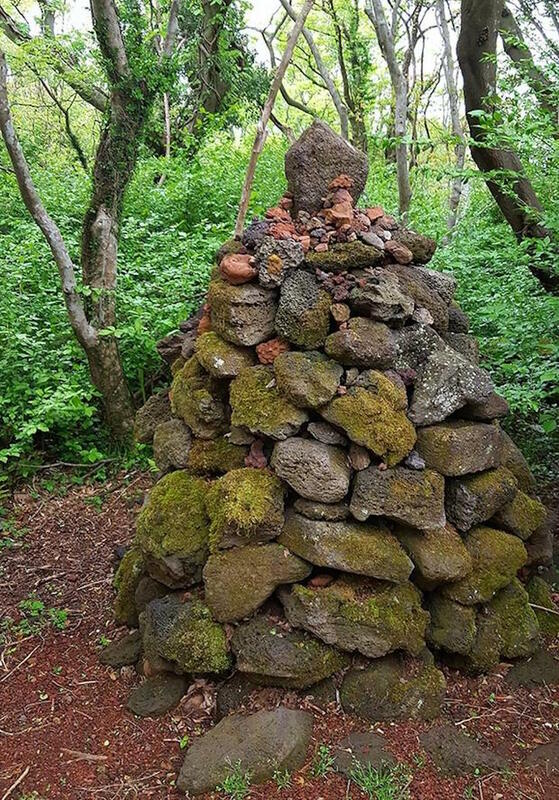 The park contains a Stone Age village with cobblestone huts and bangsatap—small, round piles of stones believed to ward off misfortune. The park also features dol hareubang, or grandfather stones, somewhat similar to those found on Easter Island. 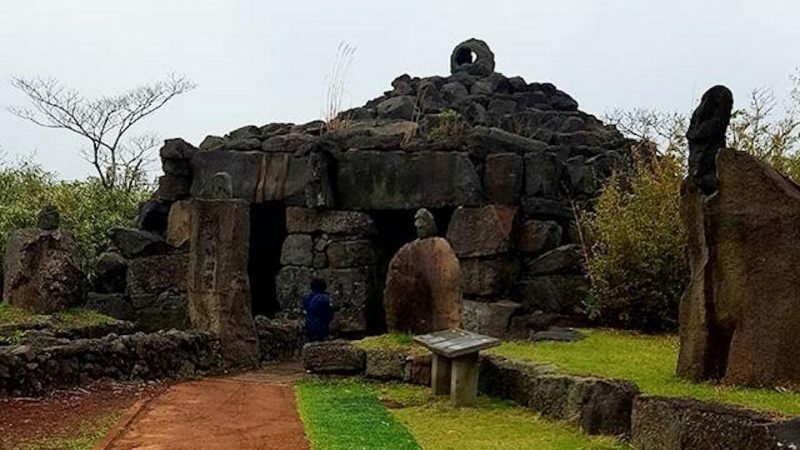 Inside one rounded stone structure, known as Mother’s Room, sits an arrangement of lava stone that is said to represent Seolmundae. The goddess is known for her boundless maternal love—according to Korean mythology, she bore 500 sons. The lava stones in this arrangement look like a mother cradling a child. A series of stone statues also commemorates Seolmundae’s ultimate fate. Her 500 sons were known as the 500 Generals. While they were off fighting in a war, she decided to make them a nourishing pot of soup. One version of the myth says she accidentally fell into the pot and died. Another version says that she threw herself into the soup, sacrificing her life to feed her hungry sons. Either way, the sons came home and were so ravenous that they devoured the soup, remarking that it was unusually tasty. Only the youngest son noticed his mother had fallen into the soup. 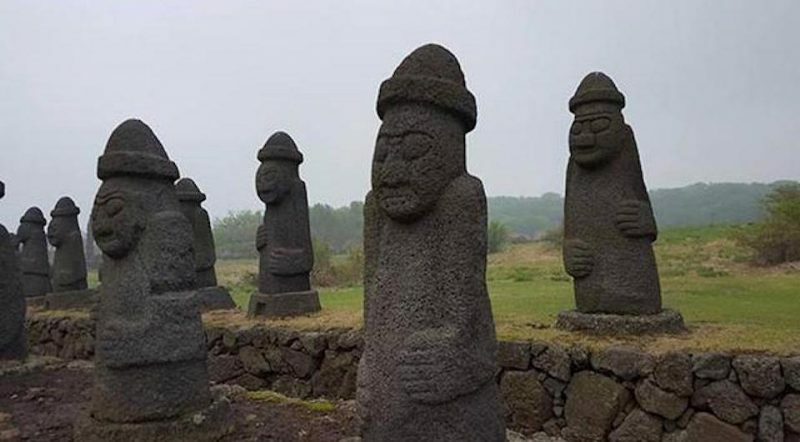 When he shared his discovery, all 500 sons were so grief-stricken that they transformed into stone. Representations of the stone generals stand in the park, frozen in their sorrow for centuries. A sky pond with water cascading over its rim represents the bowl of soup from which Seolmundae’s sons ate. Additions to the park planned for completion in 2020 will also honor Seolmundae. They’ll include a Tamna Mythology Hall, a Folk Culture Hall, and a Masterwork Hall devoted to folk crafts. These exhibition halls will line up in the shape of a woman, further honoring Seolmundae’s creative efforts. All images by Joan Vos MacDonald.